Research concerning Human Neural Organoids, Tissue Engineering, and CNS Development. Facilitate various administrative duties. Nikolai Fedorchak grew up in an Eastern Iowa semi-urban town. At a young age he was fascinated with biology after visiting a local pond with his mom where he would attempt to catch tadpoles. As a nascent adult he attended Iowa State University to learn more about Biology and Psychology. After graduating ISU with his Bachelors, Nikolai briefly attended Clarke University to learn more about physical therapy. He realized that PT was not for him. After leaving university, Nikolai took time to reflect on his experiences. With the support of family and friends he began a new chapter of his life. In a visit to a public library he came across a developmental biology book, read it, and took an interest in learning more about developmental neurobiology. In 2016 Nikolai moved to Wisconsin to exercise his scientific curiosity and begin his work with the Ashton Group. 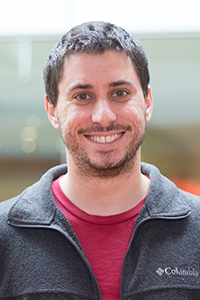 When not at lab, he enjoys rock climbing and sharing advancements in science with others. The central nervous system bears many quintessential features of what distinguishes our species from other vertebrates. Our deepest emotions, curiosity, philosophical thoughts, errors, and evolutionary survival are derived from it. At the Ashton Group I serve as an ancillary that supports the efforts of my PI, his post doc, and his students. The principal focus of our lab is to recapitulate in vitro the instructive and permissive cues that coax human pluripotent stem cells towards specific neural fates as well as create modeling platforms of the developing human neural tube; an embryological structure that gives rise to the brain and spinal cord. My interests include learning more about developmental neurobiology, stem cell differentiation, and human neural organoids. The latter allows for the creation of human-like tissue proxies that are redolent to parenchyma found in distinct regional domains of the developing central nervous system.